Guest post by Maeve McElligot. Maeve has an MLIS from UCD and a postgrad in Community Arts and Education from NCAD. Libraries have always had a reputation for being places of learning. Traditionally, the books housed in libraries have been perceived as the library's main purpose and intrinsic value. However, in today's increasingly digital world, public libraries are also a great source of person-to-person and creative learning experiences. This learning experience is what will keep public libraries relevant in a world where access to information and books is changing rapidly. Since the early 2000’s maker spaces and workshops have played a significant part of many public libraries programs in the US. Here in Ireland we have seen the popularity of Codojo and Scratch workshops in libraries, proving that public libraries have a significant role to play in this era of digital learning. Since 2014 a LAB program of workshops in 3D printing, coding and electronics has been happening in dlr LexIcon, Dún Laoghaire. This program has included workshops for kids 8-12 years in Scratch, Mine-Craft, Basic Coding, Raspberry Pi and teen STEM projects. dlr Libraries has developed the educational program of the LAB space with monthly Maker Drop in Sessions These sessions are open to anyone with an interest in exploring new tech ideas and developing prototypes. The Digital Technology Curator Dr Jake Rowan-Byrne is on hand to work on developing ideas and provide tech help. With a membership of over 300 individuals on meetup.com, this is proving a popular part of the program. 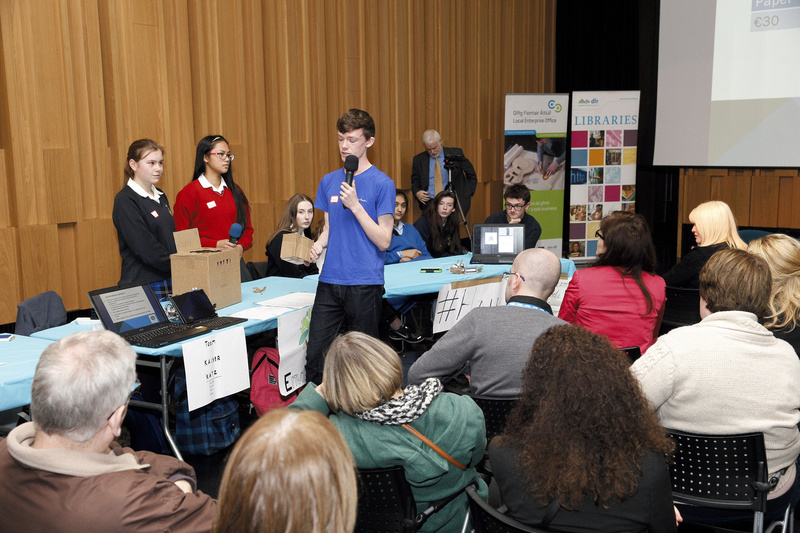 In 2016 a Teen STEM Entrepreneur Boot Camp was launched in the LAB Space in LexIcon, involving 6 weeks of workshops and maker sessions with 24 TY Students (15 - 16 years) from 8 local Secondary Schools. 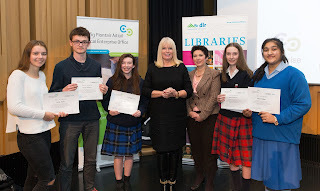 The project was funded by dlr Libraries and dlr Local Enterprise Office (LEO) with workshops given by Dr. Jake Rowen Byrne and Arial O Sullivan. To build team work and communication skills through group presentations and pitches. To promote the library as a place of learning to teens. The program consisted of 4 weeks of workshops in Coding, Raspberry Pi, Arduino, 3 D Printing, Prototype Design, Business Pitching, and Design Thinking. The workshops were student-centred with an active learning pedagogy marrying theory and practice. To enrich this experience, the students met with a new technology developer and entrepreneur, Anthony Quigley who shared insights into career options in STEM. To complete the learning cycle student teams of 4 – 5 students were challenged to develop a project to integrate and apply their learning during 2 maker days in dlr LexIcon. The program finished with a Show and Share event at dlr LexIcon on 30th November 2016 at which participants demonstrate their projects to peers and other stakeholders including the Minister for Jobs, Enterprise and Innovation, Mary Mitchell O Connor TD. Projects include a MEDISPENSER, a programmed unit to dispense medication daily and alert your local doctor if /when your prescription was running out. An Enviro – Bin that sorts and compresses recycling waste for more compact storage in the home and the Haiku watch, a wearable usb storage device that could only be used and unlocked with an individual secure code. Feedback from the students was hugely positive. In March 2017 we are planning on running a focus group with the students involved so we can improve and expand the project in autumn 2017. All workshops and materials for the camp where free which does put a strain on resources but dlr libraries is hoping to seek SFI funding this year to expand and develop the project. What we (the librarians) the learned. The role of the library in these projects is to be less of a content/book depository or provider and more of a networking, community and creative space and platform, where participatory activities and learning is promoted and supported in the building. This is an exciting time for public libraries and Lab/Maker spaces offer new and meaningful ways to engage with our communities and library members, as well as the opportunity to attract new members. On 3rd December 2016 the A&SL Section screened the documentary The Safe House: A Decline of Ideas by filmmaker and poet Greta Bellamacina and journalist Davina Catt. The documentary investigates the history of British public libraries and their decline in present day Britain. The documentary chronicles the beginnings of the public lending library in Scotland in the 18th Century and explores the important place that the library had in British society. The filmmakers interviewed many well known personalities such as Stephen Fry, John Cooper Clarke, Irvine Welsh and William Seighart to discuss what public libraries mean to them. The documentary is essentially a love story to public libraries and a plea to politicians to save Britain’s libraries from further cuts. The A&SL organised for the filmmakers to attend the screening and afterwards there was a Q&A session which was quite interesting. There weren’t many other public librarians in the audience. Having watched the documentary and listened to Greta and Davina speak of their love of libraries, the process of making this film, and their efforts to interview various personalities, I felt profoundly sad and at the same time annoyed. Libraries in the UK are facing the biggest crisis of their histories. According to the BBC over 8000 library jobs have disappeared in the last six years in the UK. In many areas the councils have turned libraries completely over to volunteers, but without proper structure and a qualified librarian to organise and run these libraries they have been slowly closing. Annual visits to libraries in the UK decreased by 14% in 2015 and by up to as much as 21% in more deprived areas. Politicians use this kind of information as excuses to close even further libraries. But of course visits to libraries decrease if hours are reduced to volunteer-only run libraries. Funding to libraries has been cut by £25m in 2015/2016 which brings to 14% the reduction in total net expenditure since 2011. That amounts to about 5p to 9p per head of population spent on stock. Compare this to the €3.77 per capita target as laid out by Opportunities for All for Irish libraries. If funding into resources isn’t being made available, then this contributes to the decrease in visitors to the service too. Here in Ireland, Opportunities for All, the national library strategy is coming to an end. There are some interesting and possibly difficult times ahead for public libraries with a new national library strategy on the way. In the past few months the public library service has been in the national newspapers with the My Open Library service and also with the new national tender for stock. Public librarians have voted against the roll out of the My Open Library service across the country. Booksellers have appealed the decision of the national tender. My Open Library is going ahead in some counties while others are delaying the implementation. The library service does need future-proofing and Opportunities for All steered the way for many great initiatives, such as all library services having access to the same e-resources and a new library management system which our borrowers love. Longer opening hours should probably be part of the next library strategy, but library staff fear that staffless hours could lead to additional unstaffed hours. What’s to stop a council from deciding to keep a small solo-librarian branch open staffless after the librarian retires? We say it won’t happen, we say we treasure our public library service, but certain cross sections of our society won’t use a staffless library and with a reduction in usage, will those branches be kept open? Watching The Safe House: A Decline of Ideas wouldn’t give you much hope. BBC, Libraries lose a quarter of staff as hundreds close. London: BBC News, 2016. Available at: http://www.bbc.com/news/uk-england-35707956 Accessed 04 Jan 2017. Chartered Institute of Public Finance and Accountancy, Spending on local libraries falls by £25m. CIPFA, 2016. Available at: http://www.cipfa.org/about-cipfa/press-office/latest-press-releases/spending-on-local-libraries-falls-by-%C2%A325m Accessed: 6 Jan. 2017. Clarke, Vivienne, Staffless libraries ‘not there to replace workers’ – Simon Coveney. Dublin: The Irish Times, 2017. Available at: http://www.irishtimes.com/news/ireland/irish-news/staffless-libraries-not-there-to-replace-workers-simon-coveney-1.2931610 Accessed 10 Jan. 2017. Cowdrey, Katherine, Irish Booksellers demand rethink on library tenders. The Bookseller, 2016. Available at: http://www.thebookseller.com/news/irish-booksellers-manifesto-asks-gov-rethink-national-library-tenders-343706 Accessed: 04 Jan. 2017. The Decline and Fall of British Libraries, Library Journal, 2015. Available at: http://lj.libraryjournal.com/blogs/annoyedlibrarian/2015/02/09/the-decline-and-fall-of-british-libraries/ Accessed: 06 Jan. 2017. Department for Culture, Media & Sport, Independent Library Report For England. London: Department for Culture, Media & Sport, 2014. Available at: https://www.gov.uk/government/uploads/system/uploads/attachment_data/file/388989/Independent_Library_Report-_18_December.pdf Accessed: 4 Jan. 2017. The Irish Times, Librarians vote against rollout of staffless libraries. Dublin: The Irish Times, 2016. Available at: http://www.irishtimes.com/news/social-affairs/librarians-vote-against-rollout-of-staffless-libraries-1.2889720 Accessed: 06 Jan. 2017. Local Government Management Agency, “My Open Library” Service. Dublin: LGMA, 2016. Available at: http://www.lgcsb.ie/en/news/my-open-library-service-welcomed Accessed: 8 Jan. 2017. Local Government Management Agency, Opportunities for All: A Strategy for Public Libraries 2013-2017. Dublin : Department of the Environment, Community, and Local Government, 2013. Available at: http://www.lgma.ie/sites/default/files/public_libraries_strategy_2013_2017.pdf Accessed: 8 Jan. 2017.